Arnold Robert Angelo was born in Queenstown on 14th October 1900. The eldest son of Rolland Stewart and Annie Elizabeth nee Kelley (Nancy), Arnold was known as “Barney” to his Otago friends. The family were from strong Salvationists and this shaped Arnold’s beliefs and ethics for the rest of his life. Arnold was schooled at Lower Shotover and later Queenstown schools, where he was dux. However, like many of his generation, his formal education finished early. The family moved to Dunedin after the end of World War One and Arnold obtained work at Thomson, Bridger & Co Ltd, a well-known Dunedin ironmonger, hardware and crockery merchant. Arnold enjoyed motorbikes and in his younger days owned an Indian Chief motorcycle which he rode with his brother Harry. He was also interested in tennis, woodwork, gardening and rock collecting. On 31 March 1926 he married Jessie (Soph) King and in 1928 their daughter Elaine Shelley was born. 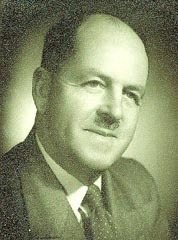 The family lived in the Dunedin suburb of Opoho until 1943 when they moved to Auckland and later Wellington, where Robert Michael was born in 1945. Shortly after Robert’s birth the family moved again, to Nelson, where Arnold was employed as manager of J.E. Hounsell and Co, a book and stationery store. Arnold later bought the business and continued to run it successfully until 1964. Arnold was heavily involved with voluntary organisations locally and nationally including a term as National President of the New Zealand Marching Association and President of the Greenacres Golf Club as well as being an active Rotarian and Freemason. Jessie died from illness in 1948 and Arnold married Ella Dawson Sutherland in 1949. Arnold died in 1972 and Ella in 1982. All three are buried in the Whakapuaka Cemetery, which overlooks Tasman Bay.